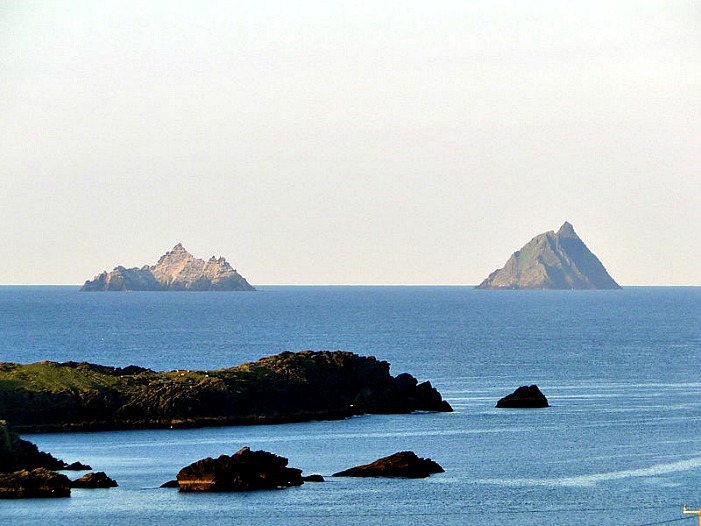 Star Wars fans may wish to head with their lightsabers to the Irish County of Kerry. A festival dedicated to the popular movie franchise makes its debut. The three-day ‘May the Fourth Be With You’ festival takes place from 4 to 6 May across the villages of Ballyferriter, Portmagee, Ballinskelligs and Valentia Island. The festival celebrates Star Wars Day and its links with Kerry. Ireland’s Star Wars journey began in Portmagee in 2014, and spans 2000kms of the Wild Atlantic Way, from the south-western Skellig Islands to Ireland’s most northerly point, Malin Head. Luke Skywalker in Star Wars: The Force Awakens. Ireland’s Wild Atlantic Way was catapulted to global fame following the release of Star Wars: The Last Jedi, with its dramatic coastal scenery wowing millions of Star Wars fans around the world in the box-office smash-hit. The festival will offer entertainment for all ages. This includes outdoor drive-in movie screenings of Star Wars: The Last Jedi against the backdrop of actual Film Locations. There are also guided film location walks, children’s workshops, a special céilí (Irish dancing) for Star Wars fans where fancy dress is encouraged, and more. You can also catch behind-the-scenes exhibitions, visit beehive huts and enjoy great tours and tastings, and the fun is all set against the backdrop of the west Kerry coast. Voyage along the cosmic coastline; gaze deep into the night at galaxies far, far away; enjoy screenings of Star Wars: The Last Jedi against the backdrop of actual film locations; catch behind-the-scenes exhibitions; visit beehive huts; and enjoy great tours and tastings. There's fun to be had from one end of the universe to the other. Be sure to pop into the Skellig Experience Visitor Centre too, for a truly out of this world experience. That most momentous of days in the Star Wars lover’s calendar, Friday, the first day is the kick-off to an out-of-this-world three days. With fun, all-ages events taking place across lively Ballyferriter, Portmagee and Valentia Island, prepare to get intergalactic at atmospheric film screenings, stunning photography exhibits, behind the scenes tours, boat trips, guided walks and much more. Lightsabers at the ready? It’s time to dive into the west coast at its most space-age. Explore a fantastic collection of photographs and videography from Star Wars’ time in Kerry in one of the county’s best known pubs, Páidi Ó Sé’s in Ventry and Músaem Chorca Dhuibhne in Ballyferriter. This growing collection of photographs – taken and donated by both professional and amateur photographers – gives a glimpse into the national and international excitement felt when the production began filming on the Wild Atlantic Way. Take a voyage around the coastline that Star Wars captured on the silver screen, while aboard the North Star Cruiser. Enjoy a leisurely cruise with local Skipper Michael O’ Connor, as he shares local knowledge of pretty Smerwick Harbour and takes passengers directly from Ballydavid Pier to open ocean locations boasting exceptional views of the coast. All aboard! All local and visiting sailing yachts, Galway Hookers, power boats and RIBs (rigid inflatable boats) are invited to join a fantastic flotilla of boats that will sail from Dingle to Smerwick Harbour/Ballydavid Pier. Sailing all along the breathtaking West Kerry coastline, you’ll spy the backdrop to many of spectacular scenes from the latest movie. Lucky sailors will pass Dunmore Head, Ceann Sibéal and Farran, arrive into Smerwick Harbour and moor close to Ballydavid Pier. Once docked, activities, food and accommodation will be organised at both Tigh T.P. and Begley’s Bar. Time: Please contact below number for times, including depart times for the flotilla from Dingle..
Food & Accommodation at Ballydavid: Pre-booking is advised for food and accommodation at Ballydavid. Enjoy a guided walk across the very filming locations used in the latest movie. Guides (not quite Jedi but close...) will share the rich history of the areas too. Hear tales of early monastic settlements, the legendary Irish poet and Norman Lord Piaras Feiritéar, Ceann Sibéal and the many connections to the Star Wars set. With a host of unique stories and insights, find out how the village of Ballyferriter welcomed Star Wars and charmed visitors with its warmth, ceol, craic and culture. While Luke Skywalker’s hideaway of choice was among the remote huts of Skellig Michael, visitors can get up close with these types of beehive huts (or 'clocháin') without any boat trips, amid the beauty of Dingle Bay. Overlooking the bay’s inviting scenery, these intriguing huts bear a striking resemblance to those used in the making of the latest movie. Of similar structure to the the monastic huts on Skellig Michael, the ancient corballed Gleann Fahan huts are thought to have housed pilgrims, given the area's many pilgrimmage sites. Get a taste of Luke’s life with a visit to one; entry is free to visitors savvy enough to arrive with a lightsaber or in Star Wars costume. Children can also feed the baby lambs on-site during their visit. Car parking facilities are available. Point your space pod toward Valentia Island's Bray Head, set for one evening only to become the stunning backdrop to this unique movie screening event. Enjoy an instalment from the Star Wars movie saga on the very big screen in the great outdoors from the comfort of your very own 'ship' and enjoy refreshments on site, a celestial atmosphere and the naturally wonderful Wild Atlantic Way setting. Get footloose for a fun Star Wars-themed céilí in Portmagee’s village square. With props from a galaxy far, far away, the céilí craic also takes place nearby in The Moorings, showcasing traditional music, set dancing and singing. With Skellig Michael doubling as Luke Skywalker’s hermit home, take a boat trip out around the famous island, and its sibling Little Skellig, to get a closer look at the ancient island that’s gone down in cinematic history. Sit back and enjoy a driver-guided tour of the exquisite Kerry coast, embracing those incredible Skellig Island views and much more. Pop over to Skelligs Chocolate to fuel up and taste some freshly made cocoa delights. While you’re planning your next intergalactic discovery, enjoy delicious hot chocolate in the café while looking out over mighty Skellig Michael.